The most recent (2017) Impact Factor for Annals of Internal Medicine is 19.384 (Clarivate Analytics). 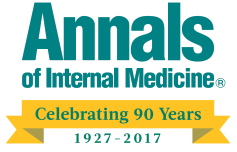 With 53,689 total cites in 2017, Annals is the most cited general internal medicine journal and one of the most influential journals in the world. Readers rely on Annals of Internal Medicine for leading-edge clinical research, systematic reviews, ground-breaking studies, newsworthy articles, and much more. Bring Annals of Internal Medicine to your institution today with a free trial! Contact us today for a customized Annals of Internal Medicine site license quote. Fully searchable, full-text online access to every issue published since 1993. Annals On Being a Doctor Series and Story Slam with essays, poems, and video that illuminate the art and science of medicine. We regularly update the Annals Institutional Site License content. Please take a minute to answer a brief question. Your feedback will help us provide information that is most relevant to you and your colleagues. For questions about a specific manuscript, please email the journal. If you need any other materials, or would like permission to use the Annals of Internal Medicine logo, please contact sitelicense@acponline.org.